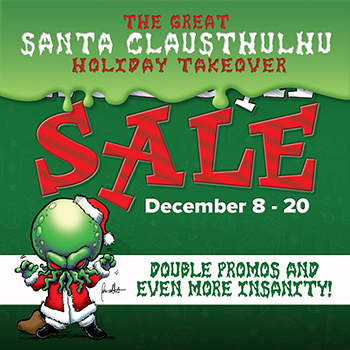 Daily Illuminator: The Great Clausthulhu Holiday Takeover Sale, December 8-20 On Warehouse 23! December 8, 2017: The Great Clausthulhu Holiday Takeover Sale, December 8-20 On Warehouse 23! Just when we thought the holiday sales had ended, the Great Clausthulhu showed up and demanded we run another sale! (And we can't say no; he can give us the gift of insanity!) So he's invaded Warehouse 23 with the Santa Clausthulhu Holiday Takeover Sale, dropping prices and bundling games, just in time for the madness of holiday gift-giving. There are so many deals and specials that we had to separate them into categories. Check out the Signed Loot, Bundles, and Deals, plus all the Bonus Swag you'll get with your order! But you only have a limited time; the Great Clausthulhu has decreed the sale runs December 8-20. After that, he has to return to his mountain of madness at the South Pole. First 50 Munchkin Gift Packs sold are signed by Steve. First 50 Dungeon Fantasy Roleplaying Games sold are signed by Steve. This swag is available while supplies last. Note that these totals are cumulative; if you order $120, you receive ALL the free things!